This Fitness for Life: Elementary School classroom guide contains everything you need to deliver standards-based wellness lesson plans to second-grade students. The guide and its DVD-ROM include the following: Daily lesson plans for class discussions and activity breaks, which take only a few minutes, fit easily into your schedule, and integrate with other subject matter areas (such as math, social studies, music, and art) Over two hours of fun plug-and-play video routines (featuring embedded wellness messages) for activity breaks, plus instructional videos to teach the movements Over 150 printable resources, including full-color signs that reinforce wellness messages, signs and worksheets to decorate, and newsletters to send home to families About the Fitness for Life: Elementary School Program The award-winning Fitness for Life middle and high school programs now have an elementary school companion program. Fitness for Life: Elementary School is a coordinated program that promotes wellness, physical activity, sound nutrition, and healthy lifestyles throughout your entire school. It facilitates total involvement by using physical education lessons, classroom activities and discussions, recess, before- and afterschool activities, cafeteria events, family nights, and more. The program also incorporates nutrition guidelines associated with MyPyramid and introduces the new Physical Activity Pyramid for Kids. All components work together to reinforce targeted educational themes and messages from week to week. The Fitness for Life: Elementary School program enables you to do the following: Teach essential health-related concepts of fitness, physical activity, nutrition, and wellness Meet local and state requirements for daily and weekly physical activity Implement easy-to-follow lessons that are standards based and developmentally appropriate Enhance academic performance and help fight childhood obesity Coordinate efforts among classroom teachers, physical educators, other school personnel, before- and afterschool program leaders, and parents Meet recommendations and standards from CDC, USDA, and NASPE, among others With its integrated lesson plans, activities, videos, and resources, Fitness for Life: Elementary School can provide the foundation for a new coordinated school health program or greatly enhance an existing program. What materials are included in the Fitness for Life: Elementary School program package? Each Classroom Guide contains a bound-in DVD-ROM with the plug-and-play activities for that grade, lesson plans, and reproducibles. The Physical Education Lesson Plans book includes 2 DVD-ROMs with all the plug-and-play activities and instructional videos, a music CD to use during lessons, and a CD-ROM full of reproducible and lesson plans. The Guide for Wellness Coordinators includes a DVD-ROM with the plans for the Wellness Weeks, reproducibles, and a program overview for teacher training. 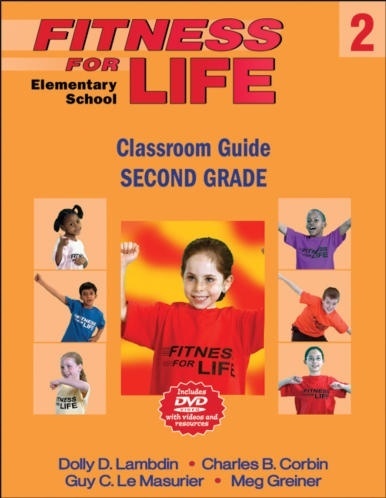 The total Fitness for Life: Elementary School program package includes the following books: Physical Education Lesson Plans Guide for Wellness Coordinators Classroom Guide: Kindergarten Classroom Guide: First Grade Classroom Guide: Second Grade Classroom Guide: Third Grade Classroom Guide: Fourth Grade Classroom Guide: Fifth Grade Classroom Guide: Sixth Grade The nine books include the following bound-in discs: 10 DVDs 1 CD-ROM of resources 1 CD of music Visit www.FitnessforLife.org to learn more.